This week's challenge is a Sketch Challenge - any stamps, any color, but to try and use this layout as a guide for our artwork. Today I'm featuring the beautiful framelits (Big Shot) and Love Blossoms Designer Series paper! Now it's time to go and see what the rest of the Happy Stampers designers have come up with for this week's challenge. Heather Wright-Porto ---- you are here - thanks for visiting! 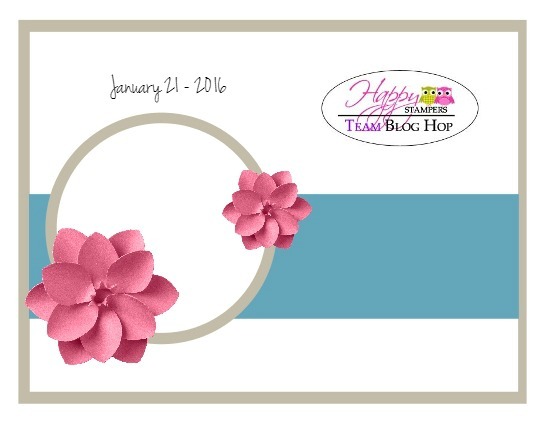 I've been featuring the lovely Love Blossoms designer series paper and the Blushing Bride Glimmer paper in my recent posts, however, check out the beautiful Botanical Blooms collection of Stampin' Up! products! Join us today! oh I love it Heather it so light and airy feeling, like that butterfly is going to lift right off. Beautiful colors together as well. Very pretty Heather! Love the colors, your butterfly is stunning! The Watermelon Wonder Ribbon adds the perfect touch under your focal image. 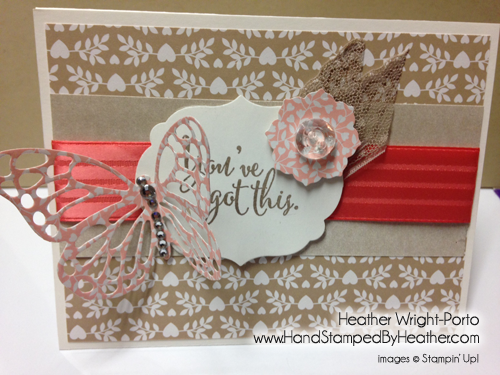 Fun card, Heather, the butterfly is a welcome sight on this dreary winter day! Beautiful...very vintage feel. I love the butterfly and the rhinestones for it's body. Great job Heather. Hugs from Shelagh.